PRX » Playlists » Did you miss the Filmless Festival? Playlist: Did you miss the Filmless Festival? The Third Coast Filmless Festival celebrated "storytelling, sound and the art of listening." Here are some of the pieces featured at the event. 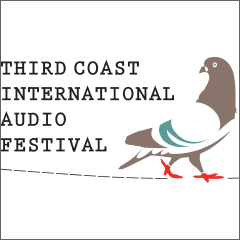 The second annual Third Coast Filmless Festival presented a day of listening indulgence, with five audio “screenings.” Each screening ran for 75 minutes, showcased a variety of audio work inspired by a particular theme, and was followed by a Q&A session with a featured producer. It all started out as a simple moose hunt...but a lot can go wrong. Dyana is going on her first moose hunt ever. Only, she's never even fired a rifle before. So, she enlists some help. But she gets more than she bargained for. Jamie Yuenger has the story. Lucy can never meet her best friend in person because it might cut her life expectancy in half. Lucy, a 28-year-old with cystic fibrosis, meets the "Bike Girl," who has the same disease, in an Internet chat room. They are both, against the advice of friends and doctors, trying to get pregnant. They quickly become friends but can never meet in person, because the Bike Girl carries a bacteria in her lungs that is toxic to anyone with cystic fibrosis. This piece is an experiment in combining fact and fiction. The interview tape is all from a real interview; the narration is semi-fictional. Most Hopi teens can’t fluently speak their language, and without it they cannot carry on Hopi traditions and culture. This puts Hopi teens in a tricky position – to either learn the Hopi language and preserve their ancient culture, or to abandon their culture and adopt a modern way of life. A documentary poem about an afternoon that poet Susan B.A. Somers-Willett spent with Billie Jean Hill at the New York State Office of Temporary Assistance. Billie Jean Hill is a 25-year-old woman with a young son, who recently lost her job as a hotel housekeeper. All of the language in this poem -- except for the last sentence -- comes directly from the forms and flyers at the New York State Office of Temporary Assistance. A documentary poem about an afternoon spent with Billie Jean Hill at the Flag Day parade in Troy, New York. Billie Jean is a 25-year-old woman with a young son, who recently lost her job as a hotel housekeeper. Billie Jean dreams that one day she will meet the love of her life, get married, buy a home and start her own business (maybe a McDonald's franchise). She lives near the city of Troy which claims to have the largest Flag Day parade in the country -- everyone comes out for it -- including Billie Jean. She had some big plans for this day. This documentary poem is read by Brenda Ann Kenneally, the photographer who has been photographing these women of Troy for the last 6 years. Heads up: this poem contains some coarse language, and describes situations that may not be appropriate for younger listeners. Youth Radio chronicles life in Oakland, California, where an alarming number of youth homicides has weighed heavily on the community. Youth Radio chronicles life in Oakland, California, where an alarming number of youth homicides has weighed heavily on the community. The story uses as its centerpiece a poem by Ise Lyfe -- a retelling of Romeo and Juliet. The killings have been a major topic of conversation in Oakland among youth, from young poets, to teens gathered on the sidewalk, to kids taking the bus home from school. A high percentage of the victims are youth, sometimes as many as three in a single week. Youth Radio documents the words of young residents in street corner conversations in East Oakland, the neighborhood where much of the violence has taken place. The voices are Youth Radio's Gerald Ward II, Bianca Yarborough, her mom Bridget Taylor, and poet Ise Lyfe. Joseph Shabalala describes how the vision for Ladysmith Black Mambazo came to him in a dream -- in four-part harmony. Shabalala's voice takes on multiple characters as he talks about the transformative power of music in his life. Ladysmith Black Mambazo has a vocal style that echoes with Zulu songs, and with the trills that farmers in South Africa use to call their oxen. In this piece, leader Joseph Shabalala talks about the origins of Mambazo's sound, and the power of the music to bring personal and social change. Two versions of this piece are available. The full mix (5:17) includes Shabalala's story of being interrogated by police during South Africa's Apartheid regime. The short mix (3:06) will fit a four-minute segment. As in all the pieces in David Schulman's CPB-supported Musicians in their own words series, the story is told through a mix of the performer's voice and music. There is no reporter's voice heard, allowing the feature to be seamlessly incorporated into station news, talk, or music programming. Scripts for intro and outro are attached. This feature works well pegged to local performances. This piece debuted on PRX. It includes some tape that originally aired as part of a feature on NPR's All Things Considered; click additional information link for details. A small town in rural Maine recalls the impact of a beached whale on their community. Ten years ago, a whale washed ashore on the beach of Lubec in the poorest county in Maine. The people in town had to make a decision quickly—how would they get rid of a 60-ton dead whale? A year in the life of a South African teenager. Tupperware. More than a way of storing leftovers in covered plastic bowls, for many it's a way of life. "Somewhere in the world a Tupperware Party is held every ten seconds." Public television's "The American Experience" recently chronicled the history of Tupperware. But back in 1980, with only two other radio stories under their belts, The Kitchen Sisters produced this story about the icon of American plastic. Tupperware. More than a way of storing leftovers in covered plastic bowls, for many it's a way of life. Parties. Rallies. Sales sessions. Earl Tupper took the plastics he developed for WWII into post-war American kitchens. The Tupperware Party is one of the ways women came together to swap recipes and kitchen wisdom, get out of the house and support each other's entrepreneurial efforts. Adam Johns never wanted to be a worm digger, but he does what's necessary to make ends meet. Adam Johns is a self-styled entrepreneur. These days, that means digging for bloodworms at thirty cents a worm, or anything else to make a quick buck. Adam is frustrated by his circumstances and worried that he might not be able to dig worms anymore. Even so, he still manages to laugh at life. An oral history account of the successful workers' sit-in at the Republic Windows and Doors factory in Chicago in December of 2008, the first American plant occupation since the Flint, Michigan sit-down strike of 1937. It's been 72 years since the "strike heard round the world" -- when autoworkers in Flint, Michigan, occupied a General Motors plant and and jumpstarted the union movement in the United States. But in recent years, as the power of unions in the US has wained, sit-down strikes have been more common in Latin America, Europe, and even Canada. Things finally changed in December of 2008 when immigrant Latino, African American, and white workers occupied the Republic Windows and Door Factory in Chicago. Producers Dan Collison and Elizabeth Meister of Long Haul Productions spoke with the workers and organizers at Republic about their decision to stand up by sitting down -- the first American sit-down action since the 1937-38 Flint strike. Their documentary, "Si Se Puede" (Yes We Can), is an intimate account of the occupation told by the people who participated in it. It includes original music by Jesus "Chuy" Negrete. 60 seconds from the streets of Calcutta. Recorded in downtown Calcutta, India in July 2004. I was looking for a film library in the center of town and got terribly lost. I passed a row of government buildings where I saw hundreds of people queued up outside. On the street were makeshift carts and stands, where people dictated to men using manual typewriters for their official paperwork. The sound of the manual typewriters tapping away outside in the context of the bustling city sidewalk struck me as beautifully surreal and Kafkaesque, so I pulled the mic out of my bag so only the tip showed and walked down the street. 94-year old Selma Koch runs the Town Shop, one of New York's last old-style bra fitting shop.